Do you have fruit and vegetable scraps, coffee grounds, clippings of grass from mowing? Compost it this summer. All you need is a 5-gallon bucket. A community compost program started by Solid Waste Services, the city-owned trash utility, is in its third year and growing fast. There are two drop-off sites: the Central Transfer Station on East 54th Avenue in Midtown and the Anchorage Landfill in Eagle River. The compost program ties into broad efforts to reduce food waste, extend the life of the city landfill and add nutrients to soil for gardening. In 2017, the utility distributed specially marked compost buckets to about 1,000 customers. But this year, it's open to any Anchorage resident with a 5-gallon bucket, said Suzanna Caldwell, recycling coordinator for Solid Waste Services. Caldwell said the utility wants to see if the compost program can be used more broadly and if people will be able to follow the rules. The utility will also experiment this summer with curbside compost collection for its customers. To ask about specific items, contact Solid Waste Services directly at compost.muni.org. The banned items, like fish and meat, aren't allowed because they don't break down as well, Caldwell said. An overly contaminated load will end up being thrown out. She said people did a good job keeping to the guidelines in the first two years of the program. 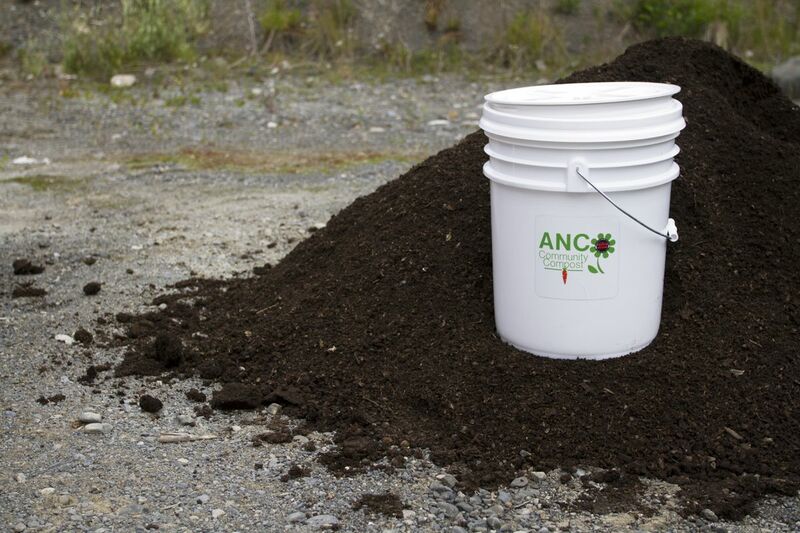 After a drop-off, American Landscaping, an Anchorage compost and plant nursery, takes what's in the buckets and turns it into compost. Finished compost will be available at both drop-off sites for anyone who wants it, Caldwell said. The compost program is running now and ends in October. Caldwell said the utility wants to make the program year-round. Solid Waste Services customers will soon also have the option of putting compost material at the curb with trash and recycling. Next week, the utility will start taking sign-ups from customers for a test program in curbside composting. Solid Waste Services tested a curbside program last year for yard waste, Caldwell said. A total of 122 Rogers Park residents participated, turning in 22 tons of material, Caldwell said. The expanded curbside program will start in early July, Caldwell said. Sign-ups will be available through the Solid Waste Services website or on the utility's Facebook page. The utility serves about 20 percent of the city, covering downtown and surrounding neighborhoods. The company that serves the rest of the city, Alaska Waste, isn't planning a similar program, said Kurt Froening, the assistant district manager. But Froening said the company monitors what customers are interested in and already has a commercial composting program involving several grocery stores. Correction: A previous version of this story misstated the address of the Central Transfer Station. It is on East 54th Avenue in Midtown, not East 45th.